Feeling embarrassed about stained teeth? Then you should read on to find out its causes, treatments and prevention tips. Your teeth are some of your natural body accessories. Just like other parts of your body, these choppers also need to be maintained and treated with care. Stained teeth can have a big impact on your self-image. You may feel self-conscious when smiling for pictures or feel shy when talking to other people. If you are having problems with this dental condition, you should keep yourself informed and know what you can do about it. There are several causes of stained or yellowing teeth. Knowing its possible causes can help you avoid them as much as possible. Beverages. Coffee, tea, red wine and soft drinks are known to stain teeth. Too much consumption of these beverages can cause discolouration of your teeth over time. Just think of it this way, these drinks can stain your clothes and utensils. They can possibly do the same to your teeth. Smoking. Nicotine in cigarettes can severely stain your teeth. Tobacco can also have the same effects on your teeth whether it is smoked or chewed. 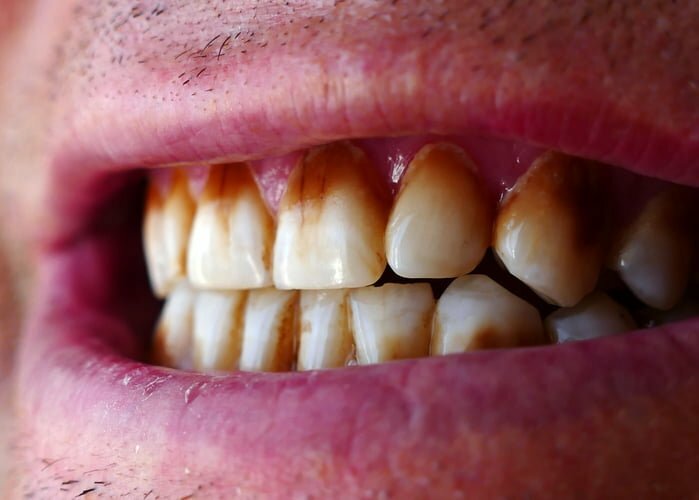 Smokers are more prone to tooth discolouration. Pulp necrosis. This is a type of dental condition where the tooth’s pulp becomes necrotic due to tooth decay or tooth trauma. The affected tooth will appear greyish black and would easily stand out from the other teeth. Poor dental habits. Those who do not brush and floss their teeth adequately are vulnerable to yellowing teeth. Plaque and other staining substances can easily build up on the teeth and cause discolouration. Medications. There are certain kinds of antibiotics that can stain teeth. Examples of these include doxycycline and tetracycline. These are likely to cause stained teeth among children with teeth that are still developing. Nowadays, there are several treatment options for people who have problems with stained teeth. A dental expert can determine the right kind of treatment depending on the person’s case. Tooth whitening. This procedure is also known as tooth bleaching. It is a common procedure in cosmetic dentistry, particularly in Sydney. This method uses carbamide peroxide mixed with water to form hydrogen peroxide. The substance breaks down stains in the dentin. Endodontic treatment. This is the treatment option for pulp necrosis. It involves partial or total removal of injured or infected pulp tissue. The pulp chamber and root canal are cleaned and then sealed. Porcelain laminate veneers. These are thin layers of material that are used to cover the discoloured area of the tooth. The type of material used for this procedure can be dental porcelain or a composite material. The availability of different treatment options today is such good news. But there are also measures you can take to prevent stained teeth. Here are the things you can do. Brush and floss regularly. The best way to take care of your teeth is to brush them properly daily. It is also advised to floss after brushing to remove food particles in between teeth. Be watchful of what you eat or drink. Knowing how some food and beverages can stain your teeth, you must be careful in consuming them. Since food and drinks cannot be completely avoided, you can minimise your consumption and don’t forget to brush afterward. Quit smoking. This is easier said than done. But if you think of it, this is a double win. You can improve your health and save your teeth at the same time. Use whitening agents. There are over-the-counter whitening agents available these days. Stain-removing toothpastes are often used by smokers. When using these products, be sure to read labels and instructions or consult a dentist first. Dental cleaning. This procedure is recommended to maintain your pearly whites. You can visit a dentist for routine dental cleaning. Having a healthy set of teeth gives you confidence and makes you feel good about yourself. If you need dental treatments, you can always head to a clinic like Marsfield Dental Care. We have been providing dental services to numerous patients for many years. If you encounter a dental emergency in Sydney, you don’t have to fret. Visit us now and get that bright smile you have always wanted!